However Ive found it increasingly difficult to use this technique with Surface Mount Devices, which seem to be getting smaller all the time. What I really wanted to be able to do was to put down an insulating layer directly on top of the PCB, so that I could cut holes through the insulation wherever I required a connection to the ground plane and in addition be able to mount components directly on top of the board without having to space them above the board surface. Whilst using a 3D printer I came across rolls of light weight, heat resistant, self-adhesive, Kapton tape which, is used to coat the printer build plate. The material is normally used in the Electronics and Space industry, so it is ideal for this application. Rolls of this material can be bought on-line for a few pounds, and have proved to be ideal for the purpose I had in mind. Its easy to apply, and small squares or other shapes can be cut though the tape and lifted off with a scalpel blade. The remaining tape acts as a solder mask and helps to keep any applied solder within the boundary of the cut-out. The tape will not melt when a soldering iron is applied, but the adhesive can lift if the iron is left on for too long. Its also possible to apply strips of self-adhesive copper tape on top of the layer of Kapton to form tracks such as power rails, or other interconnecting conductors. 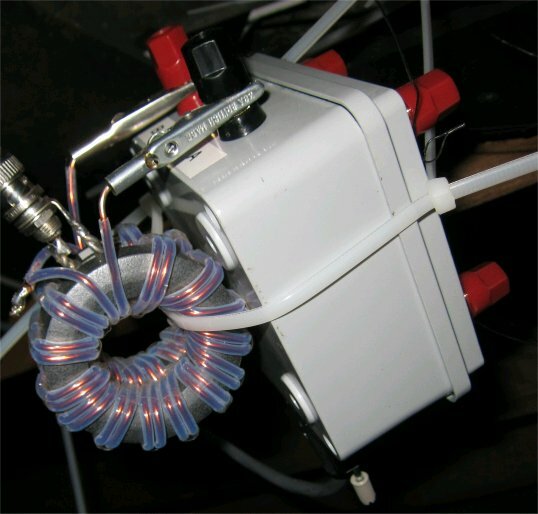 It may also be possible to construct low value capacitors and transmission lines by using the same technique. At the top of the board you can see a copper tape track stuck on top of the yellow Kapton tape. I have mounted two components close to the track, one terminal of each device is soldered to the PCB through a small hole I have cut in the Kapton tape. 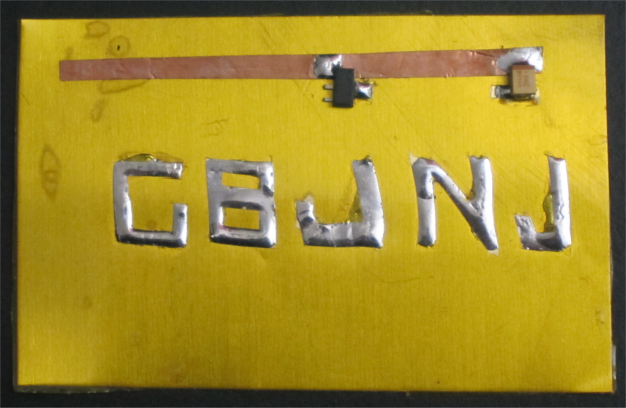 Ive also very crudely cut my call sign into the tape, removed the unwanted area of tape and filled it with solder. You can se how the Kapton tape has acted as a solder resist and confined the solder to just the area where the tape has been removed. In this case I heated the solder for slightly too long and it has started to creep under the Kapton tape. However the Kapton tape has remained intact and still provides an insulating layer directly adjacent to the soldered PCB. As the profile of circuits constructed using this technique is much flatter than the traditional high rise Manhattan style, maybe it should be called New Amsterdam style instead ! 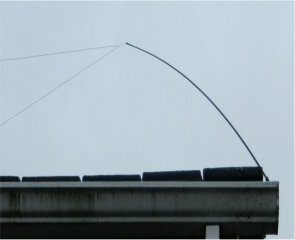 I thought I'd take a look at some of the various antennas I've been collecting at radio rallies, to see if I could rank them in terms of performance. As a few are only mono-band designs, I decided to stick to 7MHz, which is a good band for testing antennas, as most compact types which work OK on the HF bands start to struggle a bit when the physical size is only a fraction of a wavelength at the frequency in use. The measurements were made in a semi-urban environment and not on a professional test range, so some caution should be taken when interpreting the results. The test setup was 10w CW into the antenna under test, and I measured the far field signal strength using a remote controlled spectrum analyser, fed from a vertically mounted Datong active antenna at a location about 8km from the TX site. Some interesting surprises I think, especially if the relative size and cost of the antenna is also taken into consideration. The loops would probably be more effective for inter G due to NVIS contribution, which I did not try to measure this time around. The G8JNJ QRP loop seems to work just as well inside the house as outside (~2dB difference) . However this could be because it was it was coupling into the house wiring (the ADSL dropped out too when I was testing). It didn't seem to give a peak response in the correct direction, which it did when it was mounted outside. In contrast the Watson Multi-Ranger 9 seemed to work a lot better outside (~20dB difference) with a reasonable ground system, than when used inside with the central heating pipes providing the ground plane. Although it should also be noted that the performance of the Ranger varies a lot from band to band, particularly on the HF bands, where the loading coils became noticeably warm and its performance droped below that of the G8JNJ QRP loop. However on 80m the Watson Multi-Ranger 9 worked better inside the house than the G8JNJ QRP loop. I used additional sloping radials with some antennas in order to raise the base above the surrounding foliage. I found this to be particularly important with the base loaded antennas as their efficiency suffered quite badly if any other objects were near the loading coils. This is an experimental project to create a stealth antenna using four wires angled down from the house roof, which can be switched in various permutations to lobe steer / null the main direction of fire. The antenna wires can either be separate wires or ends of loops. As shown in this example. 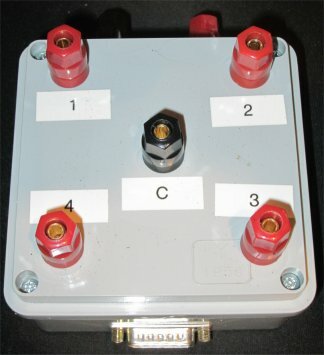 Each antenna wire can be separately connected to one of four possible points. RF feed A, RF feed B, a common point C, or nothing at all. 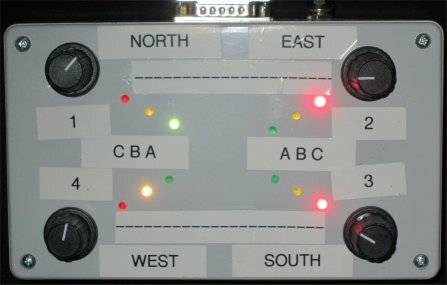 In this example the RF is fed via the A (green led) & B (yellow led) ports. Which are connected to the North and West ends of two delta loops of wire. The other ends of the delta loops are connected together via the common point C (red led) or disconnected from each other (no led). Physically the relay box is mounted at the centre of the roof near the chimney. The basic switching concept works fine, but the relays I used don't really provide sufficient isolation between switched and un-switched wires. The transceiver and screened multi-core control cable are passed through separate choking baluns mounted near the relay box. 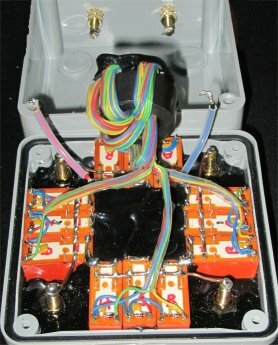 This is to help reduce any common mode current which may exist on these cables. Which may contribute to pattern imbalance, noise on receive and RF in the shack on TX. 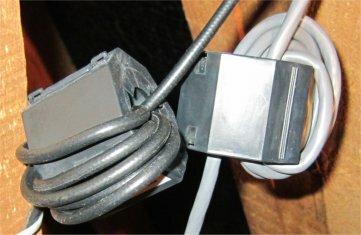 The coax is connected to the relay box via a good quality 4:1 Guanella Current balun. This is to help provide further isolation and present an easier match to the remote coax fed auto-atu. However the overall gain is considerably less than Id hoped for, and much lower than my all band 90ft doublet. I think one of the problems is the lack of height at the feed point, and the close coupling into the structure of the house. I've now temporarily tried spacing the wires away from the roof. By using some tip sections of fishing poles. Which I have attached to the guttering by means of very large crock clips. This has improved things slightly. But the performance is still less than I'd originally modelled. 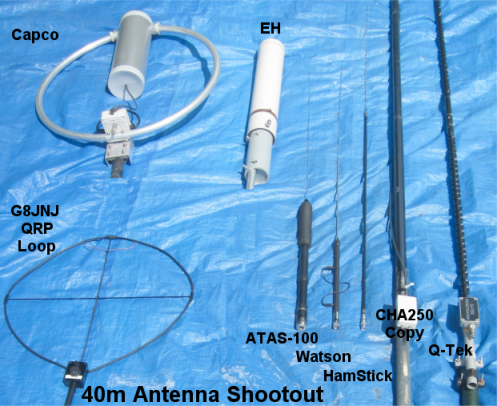 Various types and designs of Active Antennas for use on the Short Wave bands. 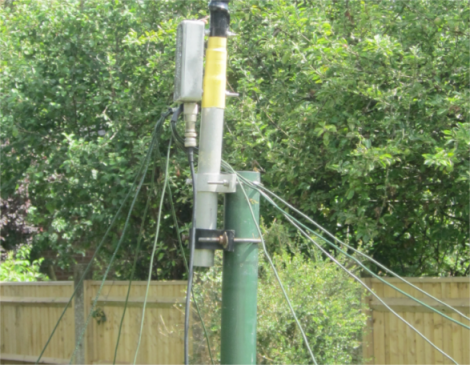 Here is a novel way to use up old sets of Christmas lights - as a HF vertical antenna ! This animated sequence of photographs show the changes in current distribution along a 5m tall base fed vertical. Consisting of a string of Christmas lights with approx. 40 bulbs connected as four parallel strings of ten and fed with an auto tuner at the base. The frequency in use increases gradually from 7MHz (most current at base) up to 50MHz (two current peaks with a null in the middle). The lights are brighter where the antenna current is greater. Note that the lamps have a non-linear response, as their resistance changes as they heat up. So the current distribution shown by the lights is not quite correct, but it does provide a good indication. Here's some of the stuff I'm currently messing about with - please drop me a line if you have any interest in particular subjects. 70MHz transverter  I got hold of a ready built and boxed 28 to 70MHz G3WPO transverter for £5.00 at FRARS. The TX side works and gives 0.5W out but the RX is a bit deaf. I've now got hold of a circuit diagram so I should be able to do some faultfinding. All I need to do then to get on 4m is to build a linear PA. Either a £30 brick or an ex PMR PA strip with some biasing should do the job. 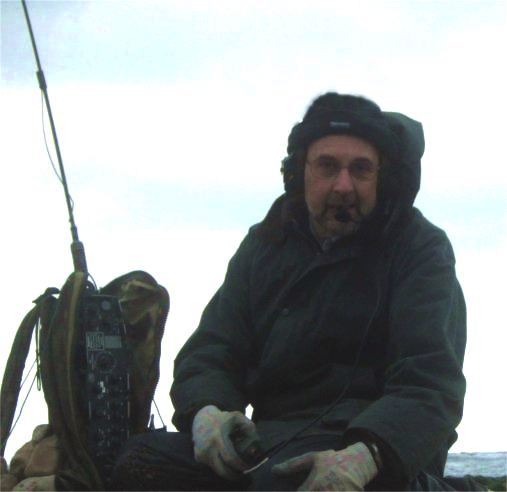 Mil Radio  The recent improvement in sunspots has allowed me to work DX including Israel and the US on 10m using just the PRC320 manpack and 2.5m Whip. I've now got hold of two more scrap PRC320's which I have got working. One needed a major rebuild as the wiring harness associated with the turret tuner had been chopped through, when it was robbed by a previous owner to fix another unit. Strangely enough this one works better than the other two, even though it looks a bit tatty. Here I am, braving the elements to work stateside on 10m USB whilst getting soaked with sea spray.